Sounding like the presidential candidate he insists he is not, Gov. Andrew Cuomo unleashed an energetic attack against President Donald Trump's policies Tuesday, pledging New York will lead the nation forward with the most progressive agenda in state history. "We will make history and New York will move forward, not by building a wall, my friends, but by building new bridges," he said, apparently making a reference to the political fight over a wall on the Mexican border. He faulted the federal government, saying politicians had exploited fear and frustration that many Americans feel to deepen divisions among the population "for their own political purpose." He said some of the nation's leaders had demonized diversity to "make our differences our greatest weakness instead of our greatest strength." "They will never close our harbor. They will never close our hearts," Cuomo said. Ellis Island was the nation's busiest immigration station for decades, welcoming millions of immigrants from around the world. Cuomo calls it an "enduring symbol" of America's core values of hope and opportunity. 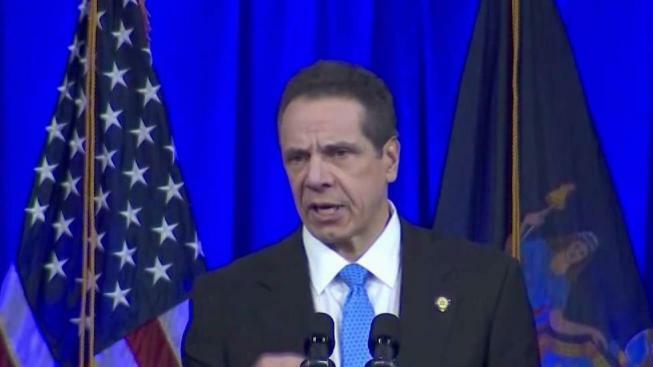 He became emotional as he recalled that his father, a former New York governor who also rejected those who urged him to run for president, died on inauguration day four years earlier, but he said he knows that Mario Cuomo's "spirit lives." "I can hear his voice and I can imagine his pain and anger if he could see his beloved country today," the son said.